Are you interested in having your child learn a foreign language? Language experts suggest that children who learn a foreign language in early childhood show certain cognitive advantages over children who do not. But not only that, learning a new language is FUN! 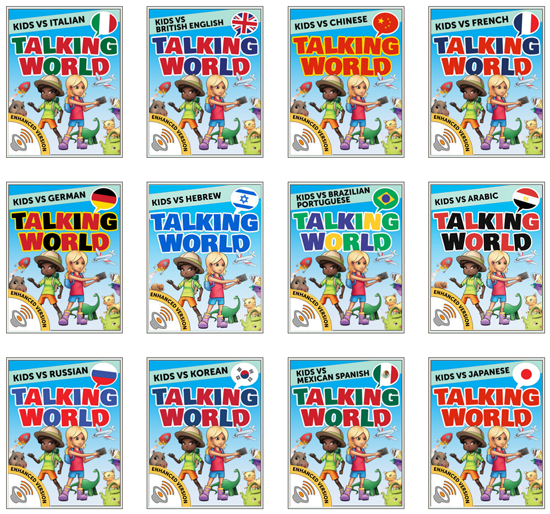 With our Talking World iBooks, your children will have a blast while learning the foreign language of your choosing. We currently offer Talking World iBooks in 34 different languages, including Japanese, Chinese, Spanish, French and more! Best of all? These iBooks used to be priced at $1.99, but now, they’re absolutely FREE! Get Your FREE Talking World iBook Now! These iBooks are perfect for children aged 18 months to 6 years+ (not to mention adults too!). These interactive books will introduce your little one to a foreign language by using kid-friendly vocabulary words and cute illustrations. Easy to understand native audio, text and translations allow your children to soak up the information with ease. Plus, with 34 different languages to choose from, introducing a foreign language to your child has never been easier! Simply tap and play – it’s that simple! The words found in these iBooks cover everyday objects every child will come across, such as household items, toys, numbers and much more! Studies show that children are much more adept at learning a foreign language than adults, making this the perfect opportunity to introduce your little one to a new language! Stay tuned! We’re always creating new and interesting learning material for your children. P.S. Subscribe to our YouTube channel! On our YouTube channel, you’ll find everything from how-to-draw tutorials to original animated music videos. Click here to subscribe now and get new videos delivered weekly! Just looked at the French version. LOVE it! Thank you for your comment, Paula! Glad you like our free iBook! Please don’t forget to give us a review and rating on iTunes so that we can keep creating more books for you.